The Intu Metrocentre in Gateshead has been chosen as the first location for a new-concept Angry Birds adventure golf attraction set to launch across the UK. The announcement follows the creation of the joint venture last January between Namco UK and Rovio Entertainment. Owner intu has signed up the new venture which has plans to develop more adventure golf sites based on the internationally popular Angry Birds franchise over the next three years. The first site will launch at the Gateshead shopping centre in the north-east of England in September to create a new leisure experience for its 20 million annual footfall. Kate Grant, regional managing director at intu, said: “Angry Birds Adventure Golf is going to provide a thoroughly entertaining and completely new leisure experience for the centre’s 20 million annual footfall alongside its great mix of retail and dining. 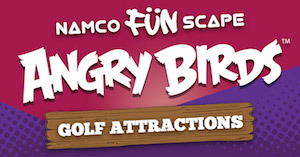 Philip Millward, commercial director at Namco, said: “This will be the UK’s first Angry Birds Adventure Golf and there’s no better place to launch such a fun and entertaining experience than at one of the country’s most successful shopping centres. We’re looking for more leasing opportunities within popular, high footfall locations like intu Metrocentre.